There's a lot of choice when looking for best led light therapy device for your skin. May be you want to know more about the working of the different colors / wavelengths LEDs used for light therapy. I try to help you by researching the various devices, so you can choose best led facial machine suitable for you. It may give you an idea about differences between a brand or model vs another. The LED light devices you'll find below become more and more popular as it cost you less than a single photo facial treatment. Images below may lead to webpages for more information, or to Amazon where you can read through the reviews which is quite informative. CONCERN: fine lines & wrinkles, anti-aging, skin tightening and supporting skin care topicals. This multi-function, bipolar device features five light colors/wavelengths: red (620nm), green (520nm), blue (465nm), yellow (590nm), pink (700nm). You can set intensity levels and there's a timer to shut off automatically. You can not set a combination of colors. The other functions are: EMS (Electrical Muscle Stimulation), RF (Radio Frequency 89 kHz) stimulation of this skin, Mesoporation and Electroporation. All meant to reduce the effects of skin aging, acne, damaged skin, blemishes, wrinkles, fine lines and crows feet. When using the device you just feel it very lightly, and it's not painful. This quite well appreciated wireless device features a rechargeable battery, and comes with a USB charger and cable. See Amazon Here for best pricing and info on the Au Fait device. Many Au Fait users also apply a Retinol serum. CONCERN: Fine lines & wrinkles, anti-aging, skin tightening. According to the manufacturer, its device gives much better results as the amount of power emitted by Pure Rayz is four times stronger than any of our competitors. Apply it five days per week for the first eight weeks. See Amazon Here for best pricing and info on the Baby Quasar Pure Rayz device for skin care. Pure Rayz users also apply TruSkin Naturals Vitamin C serum. This SkinClinical cordless device for skin care light therapy was co-developed by Dr. Glassman and named: Reverse. Read More Here about this red and infrared light therapy for skin device. Photo-rejuvenation Kit Project E Beauty LED 3 Colors with Ultrasonic Massager. This portable ultrasound machine features Red, Blue and Green Light Therapy, Plus Ultrasonic Massager. You can apply the lights on your skin separately of the massager or using it together. Comes with 30ml Duplex E Collagen. Some see already improvements or a refreshed feeling after two weeks, while it takes longer for other users, may be due to differences in skin types. You need patience. The lights reduce wrinkles, fine lines, hyperpigmentation, blackheads, pimples. Read More Here on this 3 Colors Light and Ultrasonic Therapy For Skin device. According to the company their Lyft device combines several functions for a painless and effective method of stimulating dermal activity that is easy to use. Read More Here on this LYFT Nurish Anti Aging and Skin Rejuvenation device. This Carer Acne Light Time Master for facial and body skin toning features 4 pieces of electrical tips and 16 pieces of lights on the treatment head. You can use it to remove wrinkles, and want skin lifting and skin rejuvenitation. It improves skin, promotes the formation of collagen, makes skin younger, removes red spots and acne, and nourishes and whitens your skin. See Amazon Here for best pricing and info on Carer 7 Color Ultrasonic Led Skin Rejuvenation Face Toning and Lifting. Red light therapy machine featuring 660nm (nanometers) light wavelength - red - and combined with heat induction. 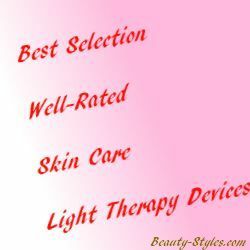 See Information Here on best red light therapy device for skincare. There's also more about the Nova Red Intraderma. Anti-Aging Light Therapy Device QUASAR MD PLUS. Improved wrinkle-reducing led light technology device - FDA-cleared, treating periorbital wrinkles (wrinkles around the eyes). According to manufacturer: 50% STRONGER than the Baby Quasar PLUS and Improved ease of use. NEW C-Factor technology and Class II medical device. Read Here more on the Baby QUASAR MD PLUS. This advanced FDA-cleared device features an all-in-one treatment head with 4 colors (wavelengths) Amber, Light Red, Dark Red, and InfraRed. The company indicates that once you have achieved your desired results, you can reduce your treatment time to twice a week for maintenance, but most people continue to use their LightStim regularly because they love the gentle soothing and relaxing warmth. Read Here more on the LightStim for Wrinkles. LED light therapy for skin device to boost collagen for firming and lifting you skin. It reduces wrinkles and fines lines, and also helps preventing wrinkles somewhat. Red light wavelength is 660 nm and light dimension is about 3 x 2 inch. This collagen boosting led lamp device features automatic time-control, so when the pre-programmed exposure time is over, it auto-shuts. See Amazon Here for best pricing and info on the NOVA RED. Tanda Luxe Skin Rejuvenation Photofacial Treatment. Red light technology has been used by dermatologists and skincare professional for its rejuvenating benefits for many years. By targeting the signs of skin aging at their source. Applied red light wavelength is 660nm. The device also features sonic vibration. See Amazon Here for best pricing and info on the Tanda Luxe. Red Light Device RejuvaliteMD for Anti Aging and Skin Rejuvenation. This RejuvaliteMD light therapy device features High Power LEDs with Red, Yellow, Amber, and IR LED Wavelengths to penetrate skin at different levels. Treats fine lines, wrinkles, age spots, sun damage, scars, and skin laxity. A user: After about 2 weeks of use, my face looks better and more even already. Also notice a lessening in wrinkles. 30 Day Money Back Guarantee - 1 Year Warranty. See Amazon Here for best pricing and info on the red led light therapy machine RejuvaliteMD for anti aging and skin rejuvenation. Caribbean Sun Light Therapy Skin Rejuvenation. According to the manufacturer power consumption of this professional model RB-PRO is quite low. It is also for international use (110 - 220 V), lightweight and portable. Eye goggles come with it. The big advantage for some users is that you don't have to hold it in your hands like with a handheld device. See Amazon Here for best pricing and info on the Caribbean Sun Light Therapy Treatment device. Anti-Aging Red LED Light Therapy Bulbs for Fine Lines & Wrinkles 660nm. The red LED lights of this popular device increases the collagen which fills in the fine lines, wrinkles and crow's feet that start to occur as we age. The benefits are easy & pain free 5 to15 minute sessions daily, comfortable home use with your own lamp. Besides using it for skin care purposes such as clarity and tautness of skin, there are also people who apply this lamp to areas of pain and indeed they feel pain relief. FREE eye protection & 30 day money-back guarantee. Read Here more on 38 LED's and 168 LED's red light bulbs 660nm. The IlluMask - LED Anti-Aging Light Therapy Mask for Younger Looking Skin, the iDerma Anti-aging Mask and the Dr Lumen Generation II Red Light LED Facial Mask. Here's more about these anti-aging masks. CONCERN: Fine lines & wrinkles, anti-aging, skin tightening, acne & blemishes. Model: Handheld. A well-rated skin care multi-functional rejuvenation machine. It is a convenient skin care device to promote skin circulation for anti-aging, treating acne, facial red, smallpox mark, pores and removing blackheads. - Improve symptoms such as aging, loosening skin, big pore and slender wrinkles. - Improve pigmentary pathological changes, such as freckle, sunburn and senile plaques. - Improve dark complexion caused by bad metabolism or poor circulation. - Repair and nurse the damaged skin. Do detumescence, inflammation diminishing and scar elimination treatment for oil acne effectively. What I also like about it, is that you can lay down in a relaxed position during the treatment. For this great-rated skin care machine , see Amazon Here for best pricing, info and reviews. This Rika light therapy and massager for face, features Red, Blue and Green LED lights with wavelengths in nanometers Red: 630nm, Blue: 630nm, Green: 520nm. The LED lights work for yearsand don't need to be replaced. Ultrasonic (massager) mode can be used together with a light color. To do that, select the Ultrasonic mode and its intensity, then select the photon and color number, and confirm. It is recommended to wear the glasses that come with the device. With a power converter you can use the device in other countries. 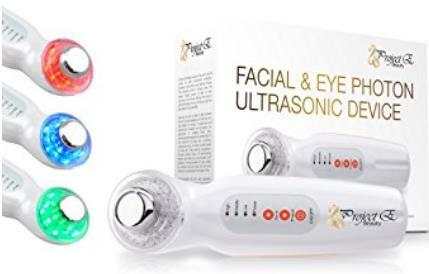 For this great-rated Rika facial light therapy and massager, see Amazon Here for best pricing, info and reviews. With this Rejuven system you get treatment heads each in a different color. CONCERN: Fine lines & wrinkles, anti-aging, skin tightening, acne & blemishes. RED: for brightening and evening the skin tone. Stimulating the collagen protein and diminishing the appearance of fine lines and wrinkles. YELLOW: for relieving irritation and aiming to enhance the immunity within the skin. It also stimulates the lymphatic and nervous system. BLUE: for killing bacteria from within the skin whilst diminishing inflammation and breakouts. GREEN: for calming and balancing the skin tone, which can help breakdown and prevent uneven melanin (pigment) production. People like to use this device also for penetration of serums and moisturizers unto their skin, and are quite satisfied with the results. See Amazon Here for best pricing and info on the Rejuven handheld led light therapy rejuvenation device. CONCERN: Fine lines & wrinkles, anti-aging, skin tightening, acne & blemishes, and supporting skin care topicals. This Sirius Nova Rejuvenation System not only has the 3 interchangeable treatment heads/panels using red, blue and green LED lights, but also a microcurrent galvanic treatment head for cleansing, lifting, toning. This Sirius Nova product has always been popular and maybe even the most sold home light therapy for skin device. CONCERN: Fine lines & wrinkles, anti-aging, skin tightening, and acne & blemishes. System with 3 interchangeable panels of precisely engineered wavelenghts of Red, Blue & Green light to achieve powerful targeted results. The blue light works well for acne and blemishes. And the device is light-weighted, cordless, rechargeable and low priced. See Amazon Here for best pricing and info on the Helios device. Project E Beauty New Anti-aging Microcurrent & Photon Therapy 7 Color Lights. Besides that it good for your skin rejuvenation, it is also quite useful for reducing and preventing wrinkles. This device features 7 color grades to stimulate skin cells and blood circulation. It's sort of all-in-one device. See Amazon Here for best pricing and info on the Project E Beauty device. This handheld features multi-color lights to treat your skin. Other functions of this skin care device are electrical stimulation of skin muscles and stimulation by radio frequency (RF). See Amazon Here for best pricing and info on the Morjava MJ-9900 device. BrightTherapy Trident SR11A Light Therapy System Red Blue Green LED Light. Light therapy system with three interchangeable treatment heads. Stops acne with the high power Blue LED light. Reduce hyperpigmentation & varicose veins with Green LED light. Fight wrinkles and aging with Red and Infrared LED light. Wavelengths: Red Light (660 nm), Infrared Light (880 nm), Blue Light (415 nm), and Green Light (525 nm). Norlanya Photon Therapy Facial Salon Skin Care Treatment Machine. Stimulates collagen production which smoothes fine lines and wrinkles. Reduces pore size, acne scars, hyperpigmentation and age spot. Output Power: 25W - 420 LEDs total - Approximately 140 LEDs of each color. With this light therapy you increase skin elasticity and improve circulation. Can you use it abroad? Yes, its AC voltage is 100-240 Volt, so you can use it abroad. Outside the U.S. you may need a plug converter to fit a wall-socket abroad. Many users seem to be quite satisfied with this product. See Amazon Here for best pricing and info. Also do read the reviews there. The Light probe will emit 3 different LED light/wavelength - red(650-730 nm), blue(430-450 nm) and yellow(560-590 nm), and two kind of micro-current. The current frequency ranging from 20-5, 000Hz which induce a smooth titanic contraction in the muscle fibers and stimulate the skins functions and circulatory systems. Best for lift up, tighten and firm the larger muscles. See Amazon Here for best pricing and info on the light therapy system. There's information on masks such as the Project E Beauty led mask, or from masks Deesse, Newkey 7 color mask, Angel Kiss led mask, and the popular 7 color facial beauty skin care mask from KRASR. Here's more about these anti-aging masks. With this Clear Rayz device you've got two light colors (wavelengths), which you use separately. The RED light fights inflammation and supports the growth of new skin cells. The BLUE light helps against acne. The device is meant for all skin types. See Amazon Here for best pricing and info on the Baby Quasar Clear Rayz device for acne. Acne Solution Device Silk'n Blue. To treat problematic, recurring acne by applying the blue light on each infected area or blemish for 3-4 minutes daily. The LED light wavelength is 416 nm (nano meter). Read Here more on Silk'n Blue Light Treatment For Acne, Psoriasis & More. Sirius Pulsar Blemish Clearing Device Review. Read Here more on the Sirius Pulsar. See Amazon Here for best pricing and info on the Tanda Zap. Masks equipped with LED lights for your acne skin. The popular IlluMask - LED Light Acne Therapy Mask. Read More Here about LED light therapy masks for acne skin to use at home. Some devices equipped with Red and/or InfraRed lights can also be use for pain relief.